make the most of your spare time. so you can do more important things. We are considered one of PR4s leading estate agents, consistently selling more property than many of our competitors…. Selling your home is one of the most stressful experiences you can go through. ...let us take as much of it away as we can. Our ever expanding friendly, local and highly experienced staff will guide you through every step of the way, from initial no obligation valuations, right through to successfully securing a buyer for your home. We are always available to our clients, even after hours; we often do viewings and valuations when most other local agents have closed. what your area's favourite agent offers you…. We believe we can offer you a more relaxed, personalised and friendly service. Our fantastic office is found in a prominent location, in the centre of Kirkham allowing us to attract a great deal of potential buyers. We are open seven days a week and provide accompanied viewings on all of our properties. 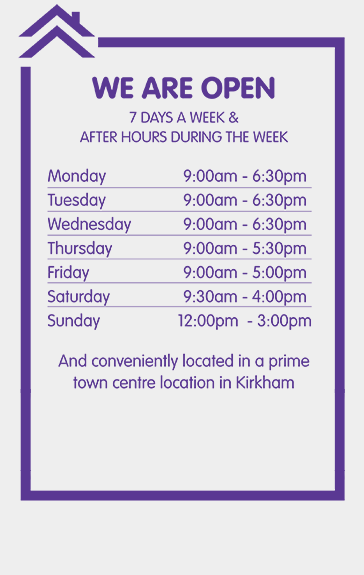 Mi Home also open after hours during the week, allowing us to carry out appointments when our clients want them most! We advertise our properties on all the major property portals (Rightmove etc.) as well as our own custom website which we personally manage. We have an extensive mailing list of potential purchasers who receive regular tailored updates on property matches to suit their criteria. Please don't hesitate to give us a call or pop in to our office for a friendly chat, a cup of coffee and to see how we can sell your home. Comprehensive marketing on property websites including Rightmove. We deliver what we say! Mi Home Estate Agents are members of the National Association of Estates Agents (NAEA), which means we are FULLY QUALIFIED! You wouldn’t use a un-qualified electrician, why would you use an un-qualified Estate Agent – DON'T TAKE THE RISK! What makes NAEA Estate Agents different? NAEA Estate agents don’t just sell houses, they help you move! Lisa, Dan and the other staff from Mi-Home go above and beyond to help you sell your home. Their professional approach, from creating the brochure to chasing the sale, made this rather stressful time easier to bear. They are efficient, experienced and very understanding. I would definitely recommend their services to others. Thank you so much to the entire team! Purchased a bungalow in September Lisa and the team could not have been more helpful. I would have no problem going straight back to them if I ever sell. Just want to say a massive thank you to Mi Home, in particular Dan and Lisa. Dan was very proactive in my search for my house and went above and beyond. He was always happy to answer all of my questions and nothing was too much trouble. Thanks to everyone at Mi Home! They sold our home in 6 days in an area that was relatively new to them. Kept us sane throughout the process which wasn’t easy thanks to solicitors! Would recommend to anyone wanting to sell. To Peter, Lisa and Dan. Thank you very much for helping me sell my house and for all your support and advise. Wishing you all The very best. It has been a pleasure to know you. Thank you to the Mi-Home team for helping us find our dream home. We had been looking for a couple of years on and off. We had many properties fall through on us and it was quite an upsetting time. All the staff at Mi-Home were a massive support through this time. They have been thoroughly professional as well as genuine and kind. When we started looking for a house once again we both said to each other "oh I really hope Mi-Home will be our agents" - and luckily they were. On the first day we started to search we were booked in to see two properties. One of the agents rang me the day before the viewings and told me that a new one had just come up that he thinks we would like. Well, we loved it more than any house we ever saw. We ended up putting an offer in on the day it went on to the market. So thank you Mi-Home for helping us find us this lovely house. We have used mi-home estate agents for a number of property sales and purchases over many years. All aspects of the service are thoroughly professional; from their extensive market knowledge, to high quality sales photos and customer service. We would highly recommend them for buying or selling your property.